It's snowing! 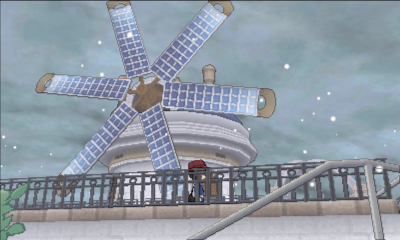 When you enter Dendemille Town, Professor Sycamore's assistants will come by to tell you about Kalos region's legendary Pokemon, Xerneas (if you play Pokemon X, or Yveltal, if you play Pokemon Y). Head over to the Pokemon Center. The girl by the bookshelf will give you a Sitrus Berry. Mr. Bonding is in his old spot and will give you the Accuracy Power Lv. 1 O-Power. In the house east of the entrance is the Move Deleter. He'll help your Pokemon forget moves. He's useful for forgetting HMs. Madam Reminder is also in the same room. For one Heart Scale, Madam Reminder will help your Pokemon remember a move it once forgotten. She can also be used to learn moves your Pokemon can't learn just by leveling up. Go south a bit to pick up a Big Root. Then, continue north. In the house in the corner, if you come to the old man after seeing 70 or more Kalos Mountain Pokemon, he'll give you something cool. Go around the corner. Go inside the house southwest of the windmill. The boy will give you TM42 Facade and the girl will give you a Leppa Berry for showing her the TM she asks for. Head up the stairs into Frost Cavern. It's snowing! Go northeast, crossing the bridge. At the other end of the bridge, you'll bump into a purple-haired guy talking to his Mamoswine. He tells you Mamoswine is usually happy to let people ride on its back, but lately it's been bothered by something in Frost Cavern. Continue north to get into Frost Cavern. 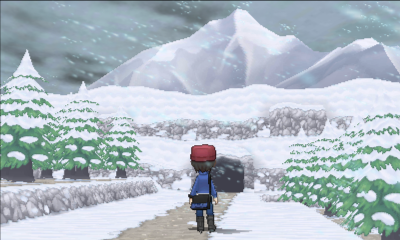 There are lots of Ice-type Pokemon and trainers in Frost Cavern. Once you enter, pick up the hidden Ice Heal on the rock near the two signs. There are patches of ice here you'll slide on once you step on it until you hit a wall or regular snowy ground. Note you can slide diagonally using the control stick. After fighting the first trainer, head east. Go north up the steps into the small chamber, where you can find a hidden Dire Hit on the rock. Go back and head northeast into the next section. This section mainly consists mainly of slippery ice. Start by sliding directly north and picking up a hidden Ice Heal. You want to position yourself properly and slide around to get to the island with the hiker. Head north from him to pick up yet another Ice Heal. Go back and continue west. Go west until you hit the stream. Surf across it, go downstairs into a room with a large, icy rock, and pick up the Icy Rock. Go back and head south. Along the way, there's a rock where you can pick up a hidden Pearl. 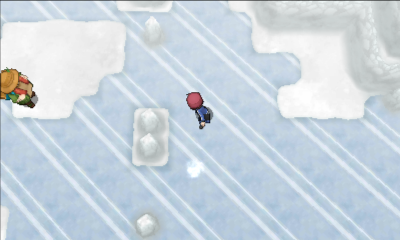 Just before reaching the end of the ice patch, slide right to pick a Max Repel. Head downstairs. The first girl you see can heal your Pokemon. Right by her is a Hyper Potion. Head up the stairs. In this hallway, pick up a hidden Super Potion on a rock. You'll end up in another section with lots of ice. Slide to the island on the west side to pick up an Ether. 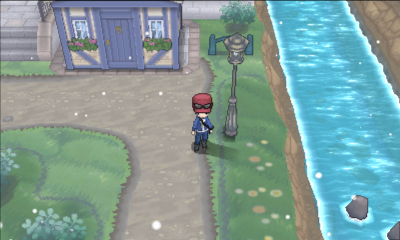 If you slide all the way east you'll reach a section with one trainer next to a hidden Elixir, a Zinc, and TM79 Frost Breath. Go back and continue north. 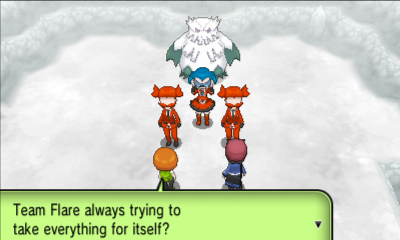 You'll walk into Team Flare members trying to catch an Abomasnow for its powers. 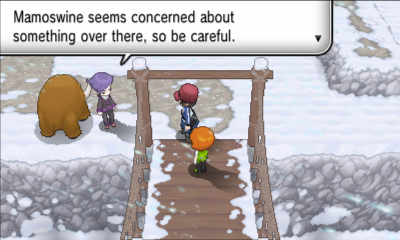 Trevor comes by to help you intervene and you'll battle the a Grunt and Team Flare Mable. After defeating them, they'll leave. Talk to the Abomasnow and it'll give you an Abomasite. Pick up the hidden PP Up in the right corner of the pit nearby. Now head back to Dendemille Town and head south onto Route 17. It's snowing heavily on the relatively short Route 17, which is covered in a thick layer of snow. 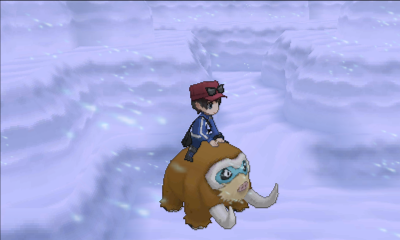 You'll have to ride the Mamoswine to get through the snow. To begin, ride Mamoswine east and smash the rocks. 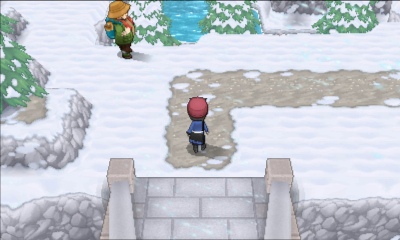 Get off Mamoswine and go down one of the paths to pick up an Icicle Plate. Head south from where you were. Smash the rocks again and walk down the aisle to pick up a Calcium. Continue southeast and you'll soon be at the end of the route. When you reach the end, Serena Holo Casts you, challenging you to a battle in front of the Anistar City Gym. Pick up the Rare Candy by the cliff. Then, continue eastward to enter Anistar City.